Funny, this doesn't look like Buckingham Candygram. As a teenager, Hugo Strange was a friend and teammate of Thomas Wayne, and was later chosen to head up Pinewood Farms, a medical research project run by Wayne Enterprises. After the project's experiments created biological abnormalities, the project was shut down, but the murder of Thomas and Martha Wayne led to it being reopened at the Indian Hill facility, under Akham Asylum. Assuming the position of Chief of Psychiatry, Strange used the inmates for his experiments, using his conditioning chair to break them, and then releasing the "cured" patients back into an unsuspecting Gotham City. And now, "fun with the peculiarities of licensing." Currently, Mattel has the DC master license: that means they can make toys based on comics, movies, TV, videogames, whatever. So how is it that this DC figure is made by Diamond Select? Because it's based on Gotham, which is a Fox production. So Fox is licensing the Batman characters from WB for TV (possibly as a holdover from the Batman '66 deal), while WB retains the rights for movies. And Fox is licensing their versions of the characters to DST for toys. Professor Strange is played on Gotham by BD Wong, best known for his roles in Jurassic Park and Law & Order SVU. Give the man credit, he did not shy away from Hugo's distinctively ridiculous comicbook appearance of a completely bald head and a chinstrap beard. The sculpted likeness is quite accurate, though he sadly not wearing his glasses. Not giving Hugo Strange glasses is like not giving Nick Fury an eyepatch - they're a part of his look, so to skip them is just wrong. 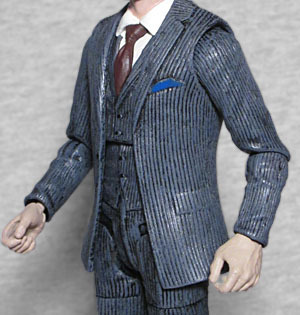 Strange is presented here wearing a three-piece suit, which may well make this a popular base for customs. Yes, that is what he typically looked like on the show, but releasing him in his lab coat would have been a fine choice as well. The jacket, vest and pants are all sculpted with vertical lines, suggesting pinstripes, and he has a pocket square peeking out of his breast pocket. The super wide collar on his shirt and the humongous knot on his tie both serve the "what year is this supposed to be" setting Gotham cultivates. The shoulders are a bit too wide, which makes the head look small on the body. Despite being a psychiatrist who spends most of his time lurking around in his office or the Arkham hallways, Strange gets just as much articulation as any other figure in this line. He moves at the head, shoulders, elbows, wrists, chest, hips, thighs, knees, ankles, and feet. The neck is particularly good, because you can get a whole host of different attitudes out of him just by the tilt of his head. It's weird, however, that the chest/waist joint is just cut through the center of his vest. Why put it there, instead of leaving the chest intact and moving the joint down to the waist, hiding it beneath the edge of the vest? 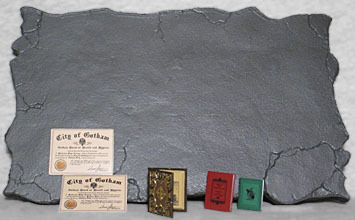 Strange's accessories include a large chunk of pavement, several books, and two signed Certificates of Sanity: one for Oswald Cobblepot, and one for Barbara Kean. The red and green books are just single molded pieces, but the brown one with the fancy gold embellishments on the cover actually hinges open, so you can learn about the Order of St. Dumas. If you buy the direct market version of this figure, he comes with his brainwashing chair and his glasses, but this one came from Toys Я Us, so that's all he had. 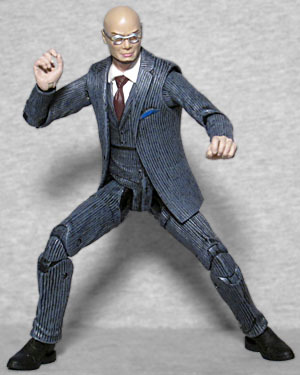 Hugo Strange is under-represented when it comes to action figures: there was a DC Direct Batman figure that came with an alternate Hugo head, an exclusive at SDCC 2013, and now this. Mattel's got a suit body they love to reuse for every damn thing, but they never made him? He may not be as flashy as the other villains, but he was one of Batman's first recurring foes, and figured out Bruce Wayne's secret identity all on his own. The only thing wrong with this figure is that it doesn't include his glasses, but that's an easy fix.